Incepted in 1991 and known as the “Royal Regiment,” The CCHS Marching Band entails the wind instrumentalists, flags, pit section, and drumline; and is a performance-oriented ensemble designed for all new and returning students to the CCHS Band Program. The band performs at all CCHS home football games and in support of CCHS Athletics. The Marching Band spends time preparing for and participating in local parades, field show competitions, festivals, collegiate band events and community events. Another very unique aspect of the course is the opportunity to represent our school and community by participating in tours in California and across the United States. 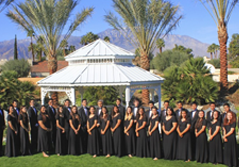 The CCHS Marching Band is well regarded as one of the Coachella Valley’s finest marching units, and has garnered this reputation through our dedication to discipline, musicality, and overall performance excellence. The CCHS Marching Band has performed in such places as San Francisco, Washington D.C., The Rose Bowl (three times), Disneyland (two times), and on national television three times as a participant in The 2005 Chicago State Street Thanksgiving Day Parade, The 2007 Pacific Life Holiday Bowl Parade in San Diego, California, and the 2010 Hollywood Christmas Parade. All Music Is To Be Memorized. Measures – Beginning To End. All Warmups In Warmup Text Book. Four Reeds In Reed Guard.